Two men from the Republic of Ireland have been sentenced to 10 years at Laganside Crown Court today for planting a bomb ahead of a PSNI Recruitment event at the Waterfoot Hotel in Londonderry in 2015. Darren Poleon (43) and Brian Walsh (35) pleaded guilty earlier this year to possession of explosives with intent to endanger life or cause serious injury to property and possession of articles for use in terrorism. Poleon and Walsh each received a sentence of 5 years in custody and 5 years on licence for possession of explosives with intent to endanger life and four years for possession of articles for use in terrorism. The sentences will run concurrently. Detective Chief Inspector Gillian Kearney, from PSNI’s Serious Crime Branch, said: “These two men planted a viable explosive device in the grounds of a hotel ahead of a PSNI recruitment event at the Waterfoot Hotel on October 9. Their intention was undoubtedly to murder and seriously injure people as well as to deter people from pursuing a career in policing. They had no regard for the safety of anyone staying in or visiting this popular hotel. I’m thankful we were able to thwart their efforts as I have no doubt that if the device had exploded people would have been killed or at the very least seriously injured. 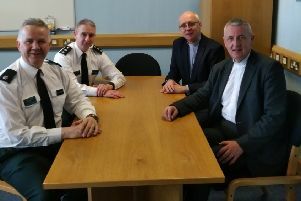 “Poleon and Walsh were initially arrested by police in the Drumragh Avenue area of Omagh on Tuesday 6th October 2015 after the Ford Focus car they were travelling in was seen being driven erratically. “When police searched the car they found a number of items including bolt cutters, walkie-talkies, a toy gun, balaclavas, gloves and two mobile phones. A SAT NAV system was also recovered from the car for analysis. The men were arrested at this time on suspicion of going equipped for burglary and possession of a firearm or imitation firearm with intent to cause fear of violence and were later bailed to return to Omagh Police Station in December. On Friday 9th October 2015, police attended various security alerts which included the Waterfoot Hotel, the Millfield Campus of the Belfast Metropolitan College and the Strule Arts Centre in Omagh, which were all venues for police recruitment events and recovered the device at the Waterfoot Hotel. “This investigation highlights the determination of our officers to keep people safe and we would ask communities to help us by providing police with any information they have about terrorist or criminal activity.